A mixed-use development, by its very nature, is one that blends residential, commercial, cultural, institutional, or entertainment uses, where various functions are physically and functionally integrated. Not only are these developments designed to take greater advantage of the land upon which they are built for more hours of each day and by more people than a single-use building would be able to do, they challenge the architect to go beyond these normal confines. Few architects would argue that mixed-use developments push the boundaries of planning and creativity to the extreme. Whether the aim from the outset is to realise a vision that blends with nature, to highlight a culture or to connect the old with the new, the importance of mixeduse developments in our view comes down to the notion of creating developments that respond to the end-users within a specific context and location within time and space. With a focus on mixed-use projects in this issue, PRC Magazine takes a look at some noteworthy projects from this category that featured at World Architecture Festival in November 2017. This year’s festival takes place at RAI Amsterdam from 28 – 30 November 2018. The vision for urbanest Westminster Bridge on Westminster Bridge Road was to set a new standard for student life in London. This scheme creates a multi-layered mix of mutually supportive uses, stacked to create a city within a single building and comprises student homes, a sixth-form college, business and retail space, coffee shops, bars, a gym, swimming pool, laundrettes, recording studios, theatre, playroom and gardens – a City Sandwich. Responding to the curved site the building’s form rises out of the ground in a sinuous wave, fashioned out of lasercut metal sheets. Each element of the white façade is handcrafted onto the sub-structure, creating a deep façade framing the view and shading a continuous glazing band. 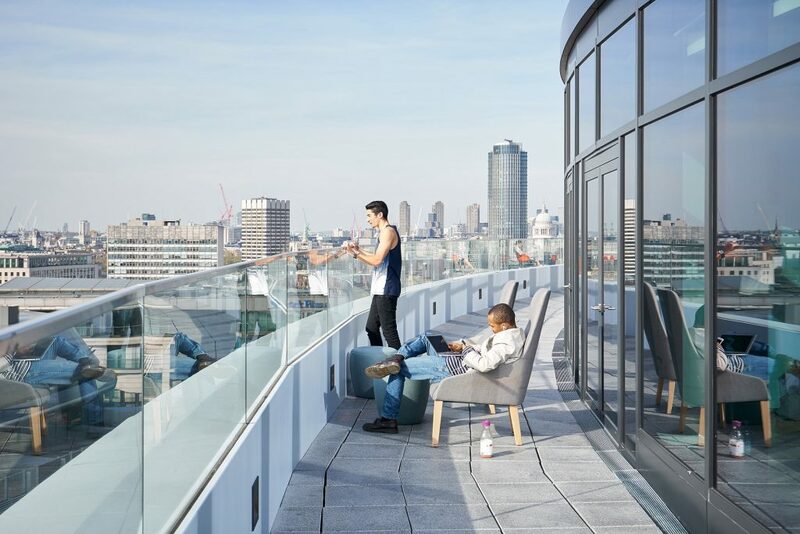 Situated on the banks of the Thames directly overlooking Westminster Bridge, the building offers spectacular views of iconic buildings such as The Shard, Big Ben and Westminster Abbey. Adjacent to the South Bank and Lower Marsh conservation areas, the site is also prominent within the wider setting of the Westminster World Heritage Site and the planning application included an Environmental Impact Assessment. Ginza Place, a major commercial development in Tokyo’s famous Ginza shopping district, occupies arguably the most prominent recent development site in Japan. Ginza’s reputation for elegance and sophistication has made it a centre of Japanese culture and commerce for more than a century. 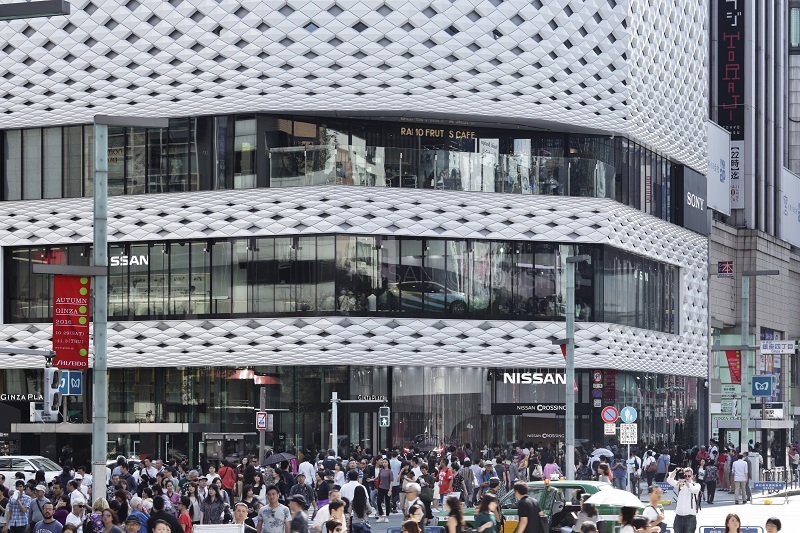 Ginza Place completes the neighbourhood’s central intersection by introducing a bold and well calculated facade to the streetscape. 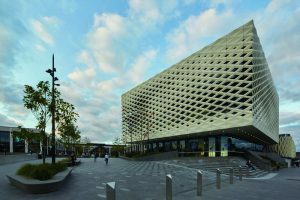 The new building had to create a public face that synthesized the surrounding architecture and captured the energy of the intersection. At the same time, the design had to reflect the sophisticated character of the district. Ginza is known not only for its elite fashion houses and art galleries, but for its renowned collection of contemporary structures. Many of the biggest names in Japanese and international architecture have built in Ginza. The facade takes its inspiration from sukashibori, a type of open latticework found in traditional Japanese crafts. The flexible architectural skin is applied unevenly over the building mass, and the composition of the facade takes it cue from the surroundings. 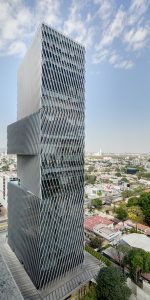 This mixed-use project for offices and a hotel is located in the heart of the city of Guadalajara. Its formal, emphatic, and unified volumetrics express its iconic nature. The formal concept arises from the mixed-use character it will acquire, consisting of four stacked geometric volumes. Two of these are slightly offset, and exactly aligned on the rear face. These gestures of displacement are designed to interrupt the robustness of the building and express an elegant sense of movement. The lowest volume houses the hotel, and the three volumes above are allocated to office use by three different corporations, each occupying one entire volume. 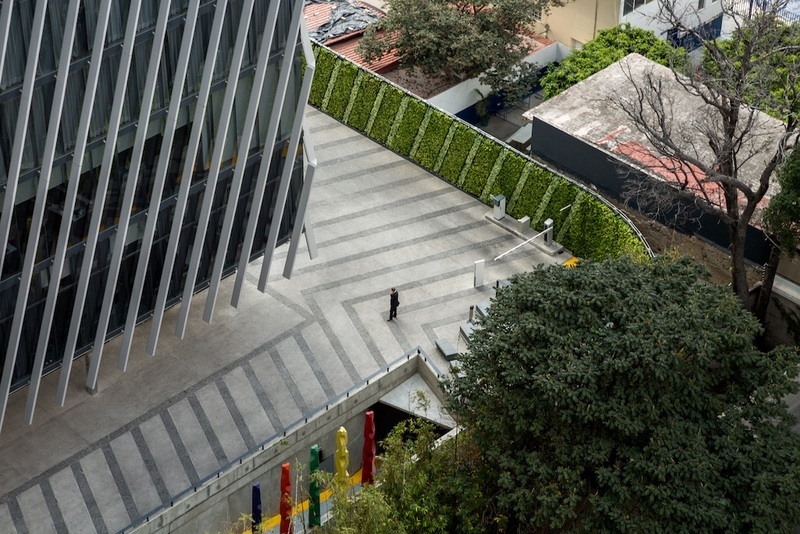 As a response to its urban context, adjacent to one of the city’s most significant urban highways, Americas Ave., the building presents a façade resembling a double skin, enveloping it for its protection. The solar gain the building will receive on three of its four sides was one of the most significant design challenges. 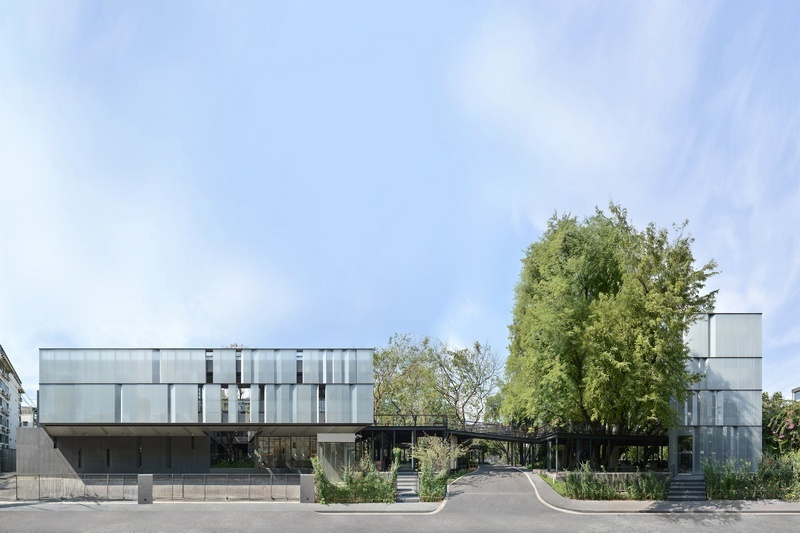 Naiipa (meaning ‘Deep in the Forest’) is a mixed-use project consisting of an art gallery, sound recording studio, dance studio, restaurants and offices. 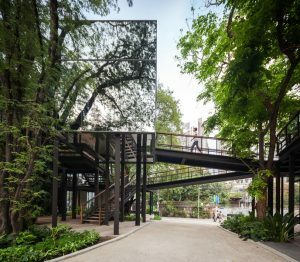 The project is named after the concept of concealing the architecture in the forest as the vision of greenery is expanded by using reflective glass all around. From the outset, the goal of Naiipa was to create architecture that seamlessly co-exists with trees, providing a peaceful and inspiring art community for both its occupants and visitors. The façade’s three different types of glazing – reflective, translucent, and transparent – along with the rhythmic folding pattern of the façade, are utilised to link the architecture to the surrounding urban context conditions, as it gradually transforms the architecture and finally vanishes into nature. 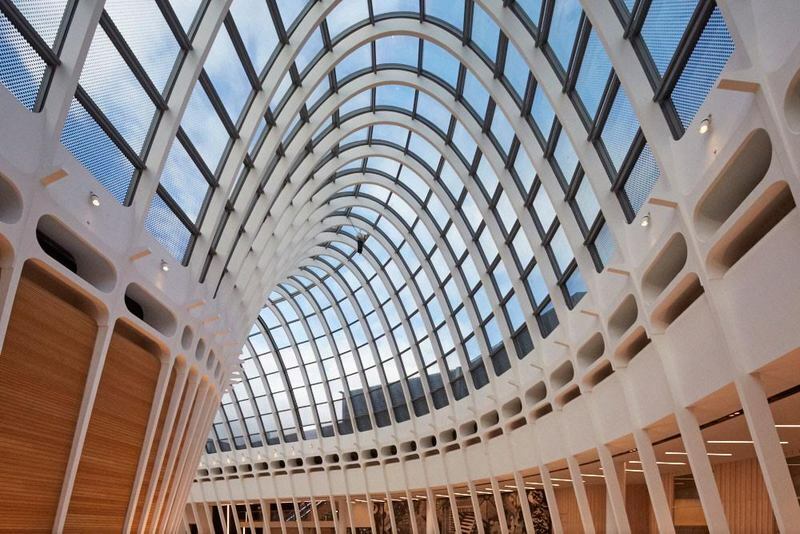 It is a case study of how a strong clear vision of a business can impact not only the ever-changing architectural culture but also the rise in interest to undertake environmental responsibility as a whole. Ringwood is an upwardly mobile outer suburb to the east of Melbourne. Since it opened in 1967 the Eastland Shopping centre has largely dominated life in the ‘centre of town’ and has undergone various transformations including a 1995 demolition and rebuilding and major expansion in 2002. The centre’s current A$665m transformation was unveiled in Q4 2015 and is the result of a 15-year planning vision that, for the first time in Australia’s history, has placed a developer, QIC Global Real Estate, alongside the council and state government in an integrated public-private partnership. The redevelopment of Eastland is the first step in a larger regeneration programme of the entire area that places the local community at its heart reimagining the way people will access the mall and use public space and transport. The new town square is designed to accommodate a range of changing public functions, such as weekend market stalls, outdoor concerts, screening sporting events and other public gatherings. This brief required a feature to draw pedestrians from Long Acre, one of the most commercially active streets in London. This Attractor is located on the south elevation of 13-14 Langley Street, an historic building of interest in the Covent Garden Conservation Area that was retained, and within visual reach of the busy Long Acre – Langley Street junction. The existing south elevation was demolished and rebuilt with three new vertical windows and brick detailing which recalls the adjoining brewery buildings on Shelton Street. A second Attractor was created in the west wall to draw people in from Mercers St. 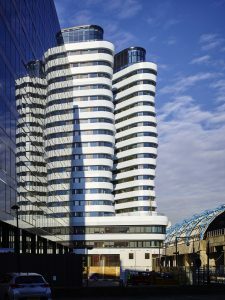 In a mixed-use development it is fundamental to design a clear circulation, asset management and maintenance strategy from the outset of the project. 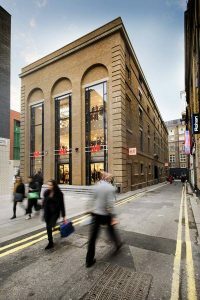 Its location within the Covent Garden Conservation Area, the various servicing requirements and the challenges of a dense urban block with existing buildings and brick vaulted basements added to the complexity of the brief. The OEAMTC (Austrian Automobile, Motorbike and Touring Club) opened their new headquarters in 2017. From the service workshops to the heliport, the goal was to develop a building that consistently takes account of the OEAMTC’s impressive range of different functions – from test hall, counter hall, conference rooms, TV studio, staff restaurant, call-centre, social areas, office atrium to helicopter support point. The new HQ also had to depict the OEAMTC business philosophy of transparency and openness. Its unique, circular and star-shaped form emphatically conveys the fact that here everything revolves around mobility and the means related to it and at the same time demonstrates the efficiency and speed of the organisation. 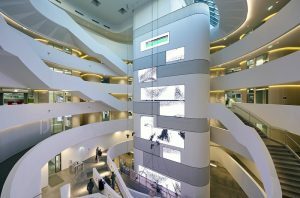 From the public/semi-public area that houses the events hall, conference rooms, and TV studio on the entrance level, through to the level above in which resides the all-important call-centre, which is constantly online and in contact with the outside world, all parts of the buildings are designed to communicate with each other.